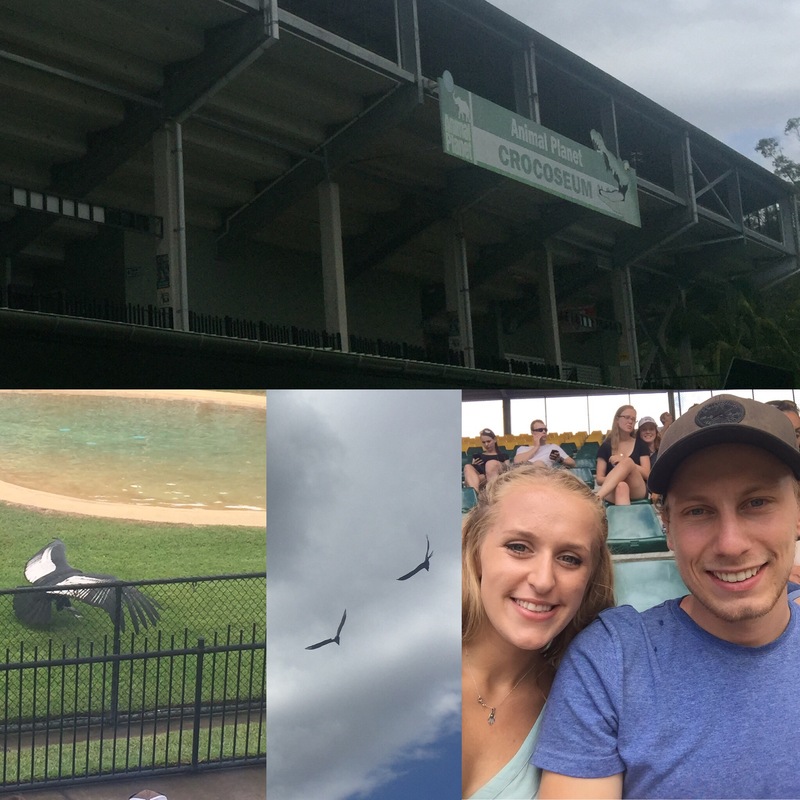 A common stop on many people’s east coast trip (and definitely one we were going to take) was to Australia Zoo. To save on travelling, we got the Greyhound bus to the zoo and put our rucksacks into a locker for the day. We arrived for the gates opening so had a full day there before our bus would pick us up and take us to Noosa. It was such a good zoo! 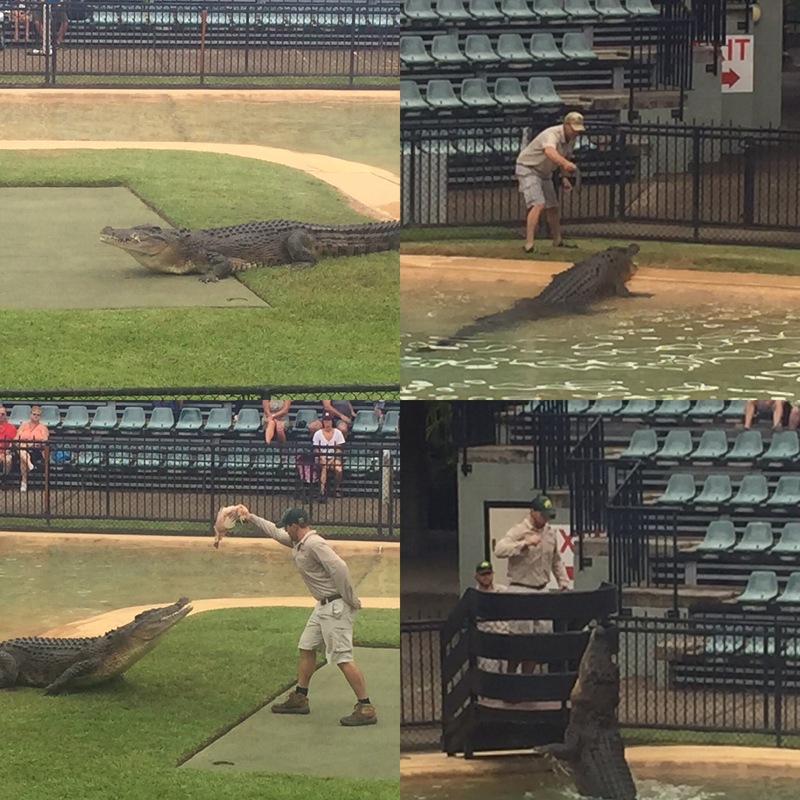 There were shows on throughout the day and loads of animals to see including – unsurprisingly as it’s the home of Steve Irwin the crocodile hunter – lots of crocodiles! This post will mainly be pictures but I will talk about the shows as they were exceptional. The first talk was with the giant tortoises. There are two of them and they really are massive. 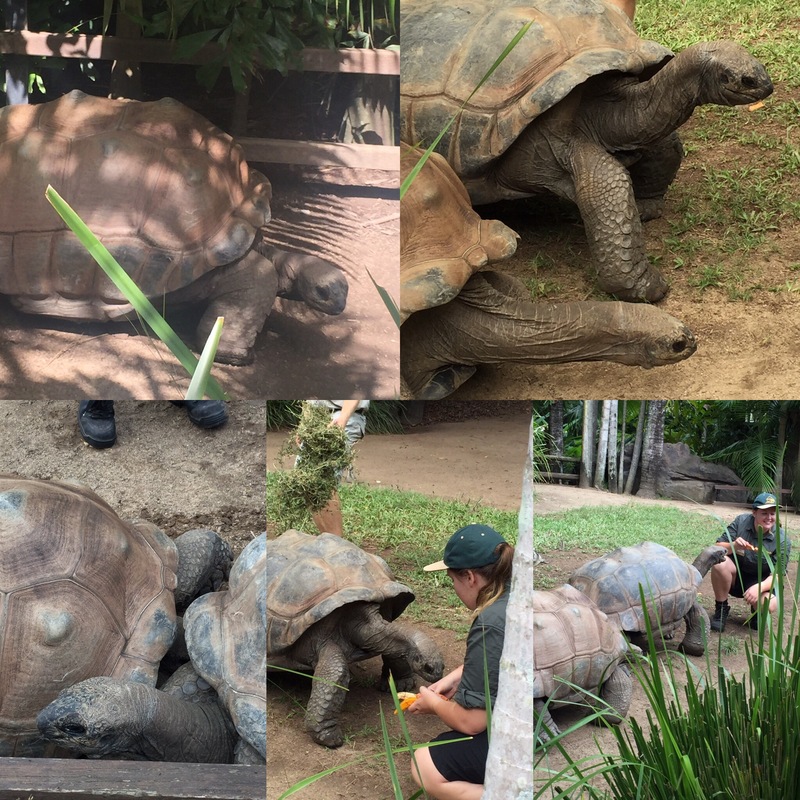 It was cool to see them up close and I was surprised how wrinkly their necks and faces were – they were actually pretty cute! They weren’t really hungry when the talk started but as soon as the food was put out about 30 lizards all swarmed onto it. There are loads of water lizards all over the zoo and the keeper was saying that they have learned the zoos schedule so know where to go to get the free food. One lizard even stole some food from one of the tortoises (two guesses who was faster)! The next show was the otters which was also really good. 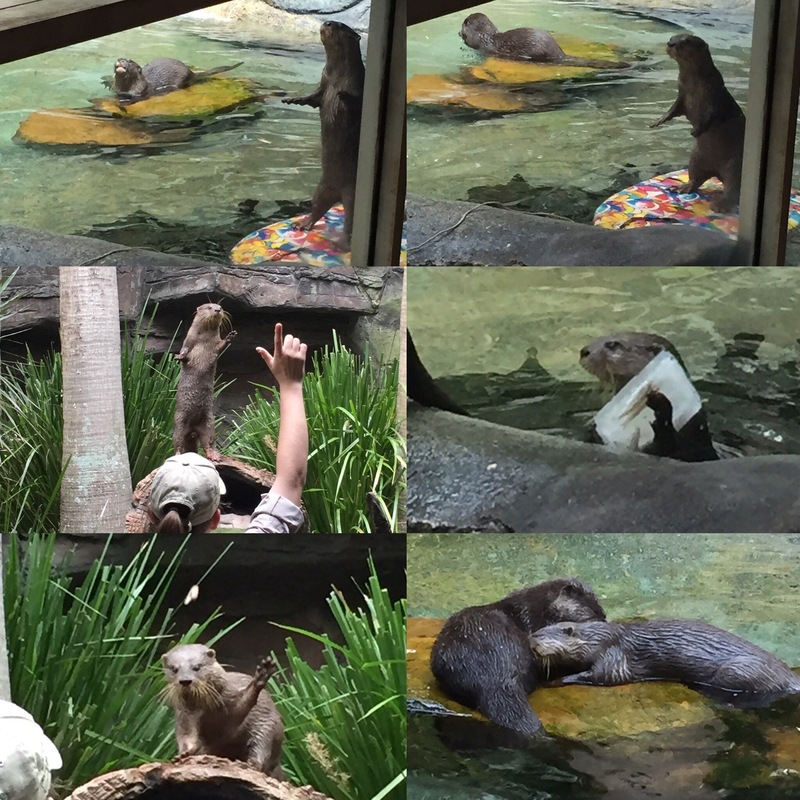 We hadn’t known what to expect but the otters do training exercises to keep their minds challenged and for play time so they were very entertaining. Their names were Rosie and Mayhem and Rosie was the one who seemed to do all the tricks – they said that Mayhem was just as smart and a great escape artist (he has been known to lead a team of otters in building platforms to try and get out of the enclosure and then breaking it down again when the keepers came to feed them) but he was just not as bothered about the treats if he has to work for them. 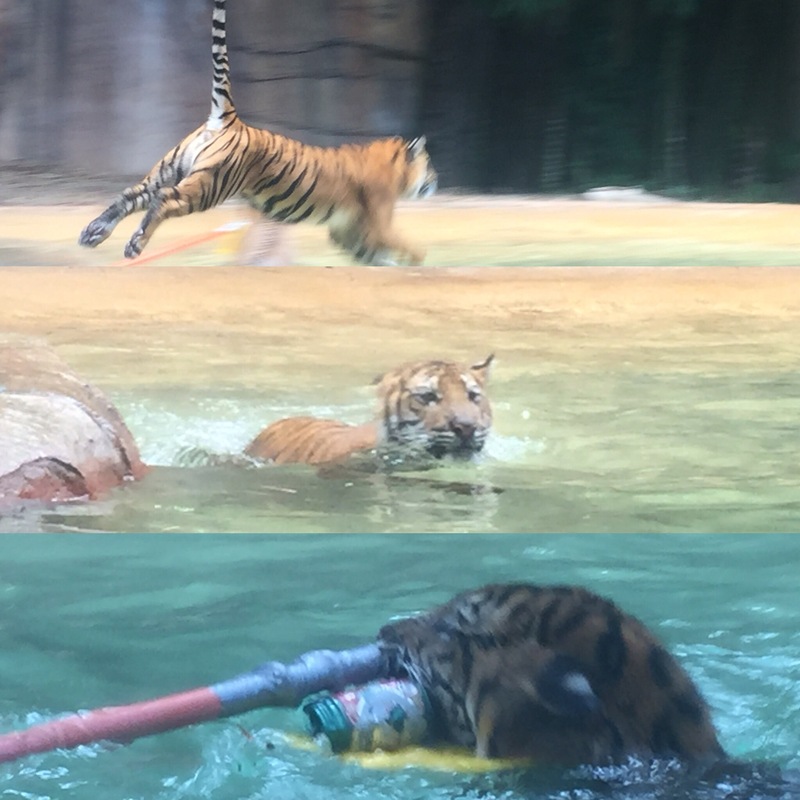 Rosie caught the food from the keeper, could play fetch and could stand up on a body board as if it was surfing – it was really good! 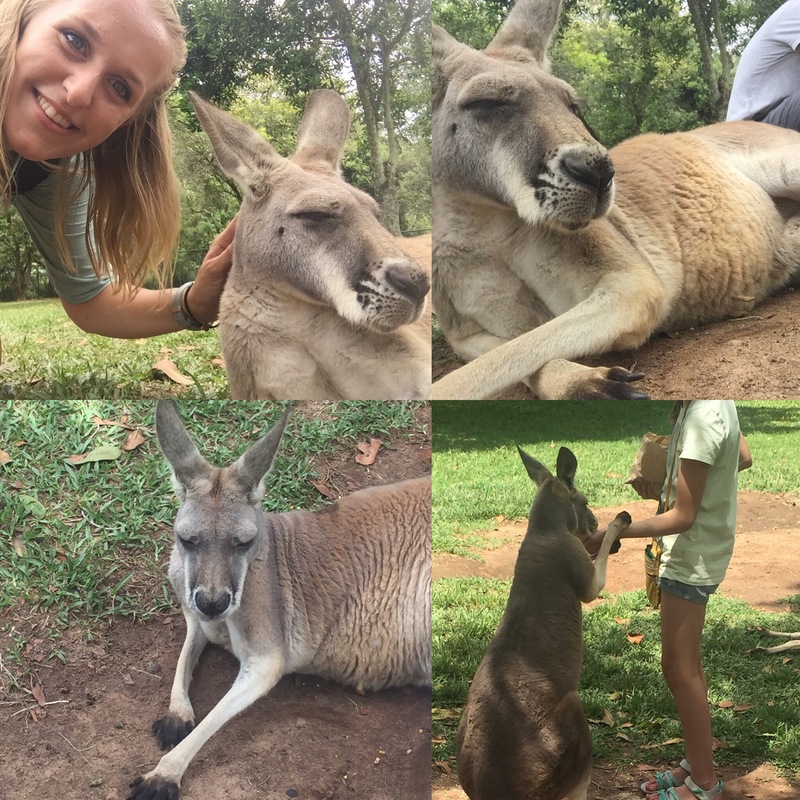 There were loads of animals at the zoo and they all had big enclosures to roam around in – the advantages of having all that space in Australia to make a good zoo! The crocodiles were really cool. 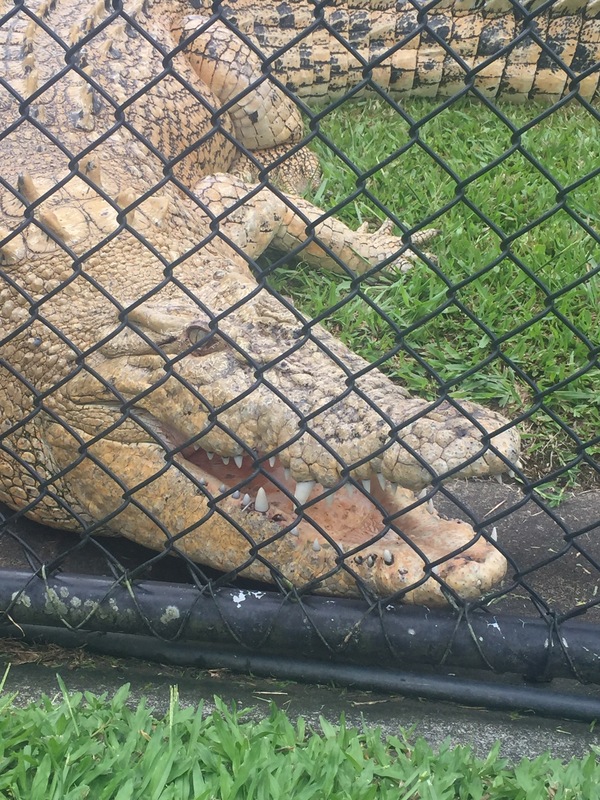 I have seen them in Vietnam and Cambodia in crocodile farms but that is a bit cruel seeing as there are so many cooked up in a small space so it was great to see them in the zoo in their big enclosures. All the crocodiles had signs about how they got there as some had been taken from the wild when they were in danger from humans trying to kill them – for example they were becoming a troublesome croc that was endangering people’s lives or affecting their livelihood. They also told you the ways Steve Irwin had caught them with one having him jump on its back to capture it! 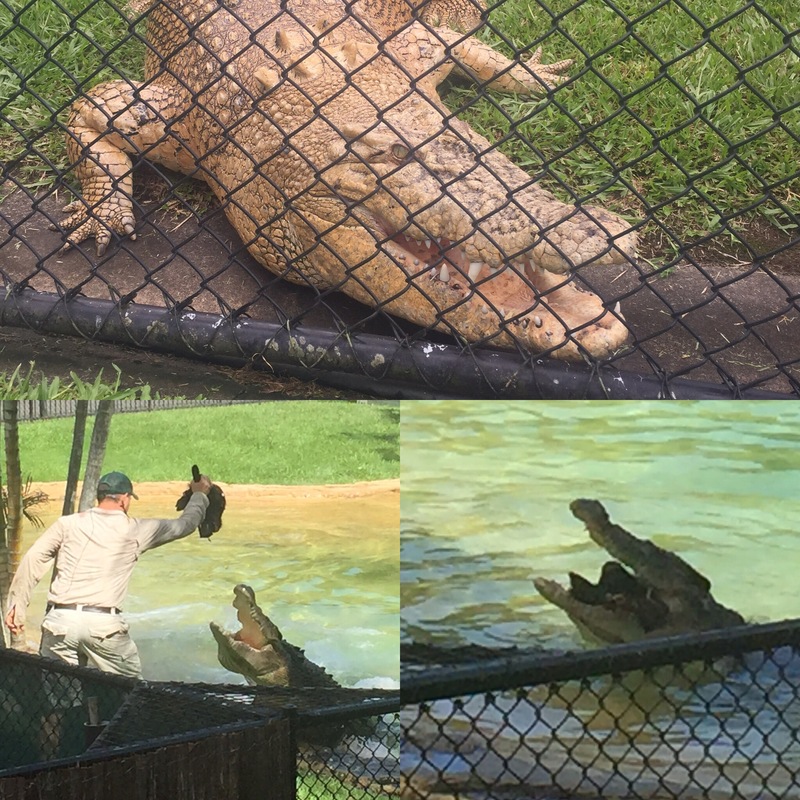 Another crazy thing with the crocodiles was watching the keepers clean their enclosures as it involved two people so that one could distract the crocodile and almost use themselves as bait so that it didn’t attack them! We got to see this in two of the crocodile enclosures and we both agreed that the keepers were all crazy! 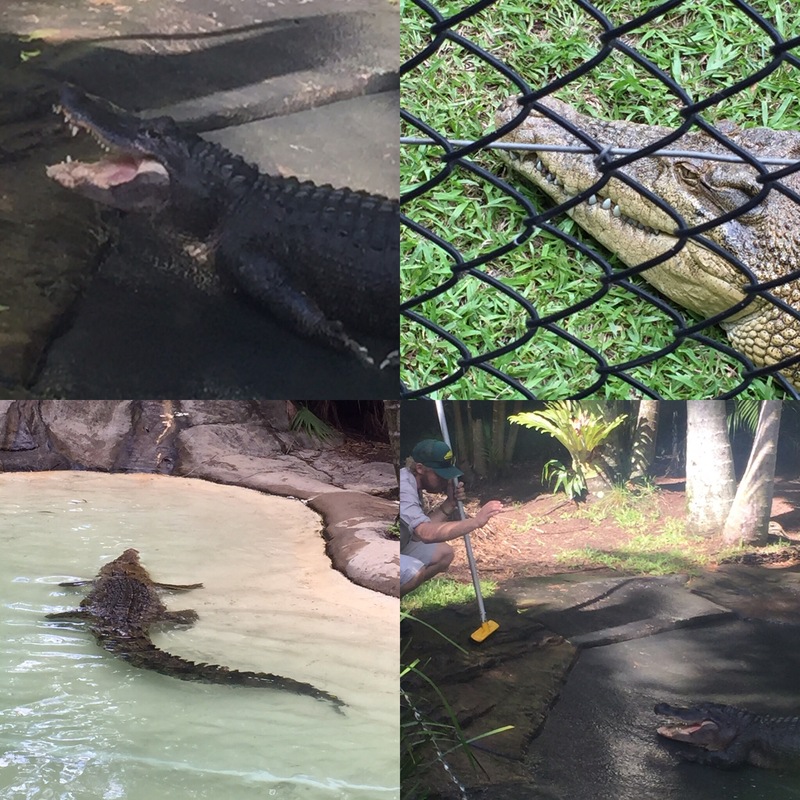 We also saw a crocodile show at the end of the day which was great because the keeper fed the crocodile loads of food to show how it ate. The funny thing was that the crocodile obviously didn’t like it being in its home and it was stalking it wherever it went which made for an interesting talk. I definitely wouldn’t want to be on the end of those teeth! No zoo in Australia would be complete without kangaroos and this zoo had a great area called Roo Heaven where you could go in and stroke and feed the kangaroos. 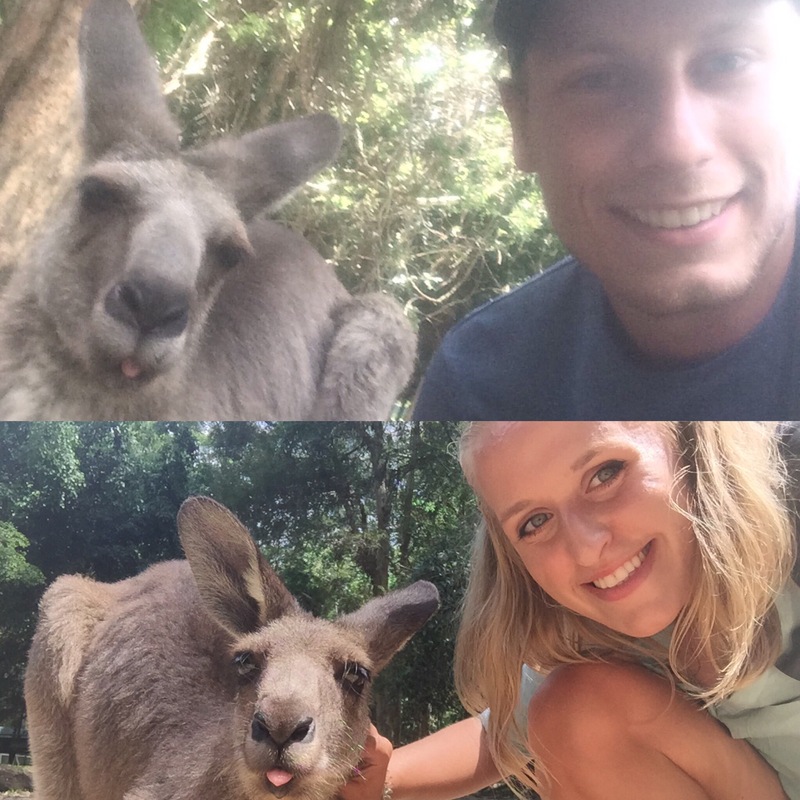 We didn’t have any food to give the kangaroos (you buy it there) but they still let us stroke and get selfies with them. There was also a separate section where the red kangaroos were and they were a bit bigger and, probably because of the time of day we saw them, a lot more chilled all lying down and sleeping. Someone was feeding one and when she stopped it the kangaroo grabbed her arm and pulled the food back down so that she would keep giving them food which was funny. 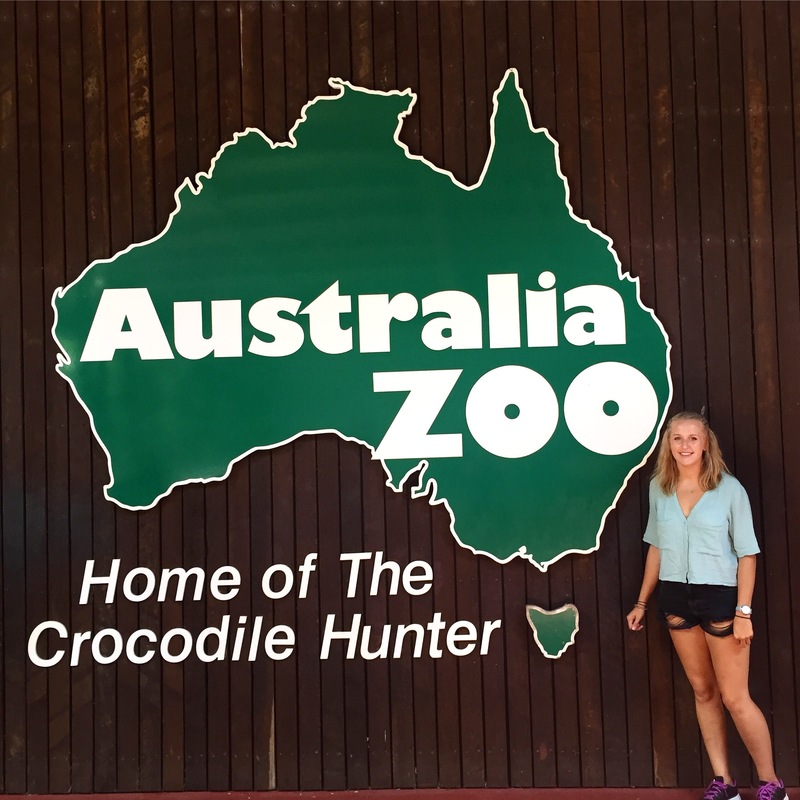 The Wildlife Warriors show is a must when you go to Australia Zoo. 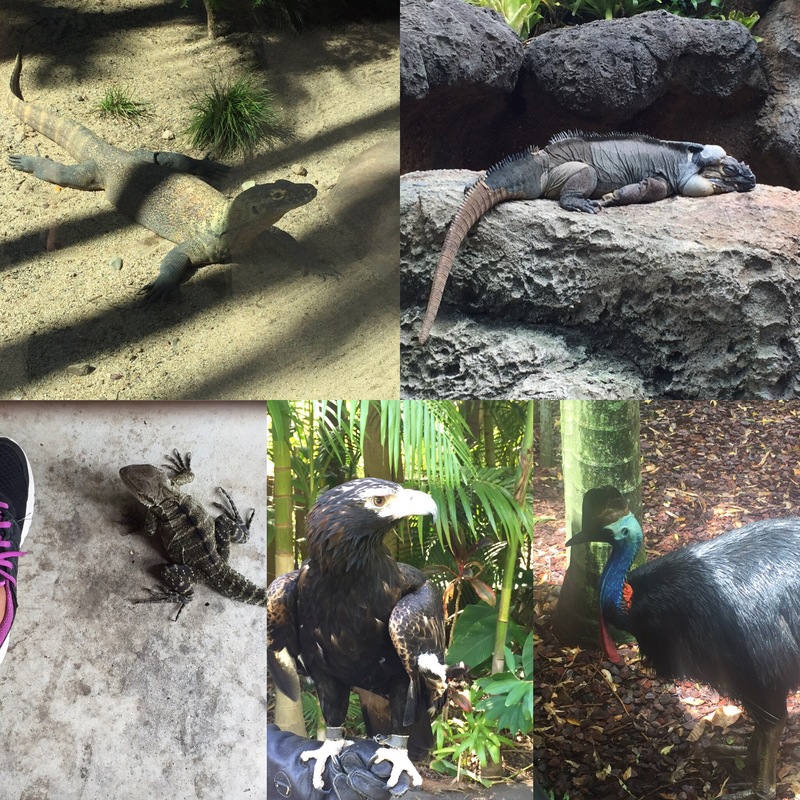 It’s in the Crocoseum which is a giant arena and the show had a array of birds which do some of synchronised flight which is really cool and there is also a giant cormorant/vulture which has a huge wing span. After that snakes are brought out into the crowd and then the crocodile is brought into the enclosure. The crocodile they used was called Graham and it was the only one they had that had actually managed to bite someone before. It was the keepers first time doing the talk and so he was quite nervous. They lure the crocodile with dead chickens and you see it come out of the water and snap the chicken out of the keepers hands. He also makes the crocodile leap up out of the water to grab the food to show what they can do. It’s such a good show but crazy how close they get to it when it’s still so dangerous and would be happy to eat them if it had the chance! 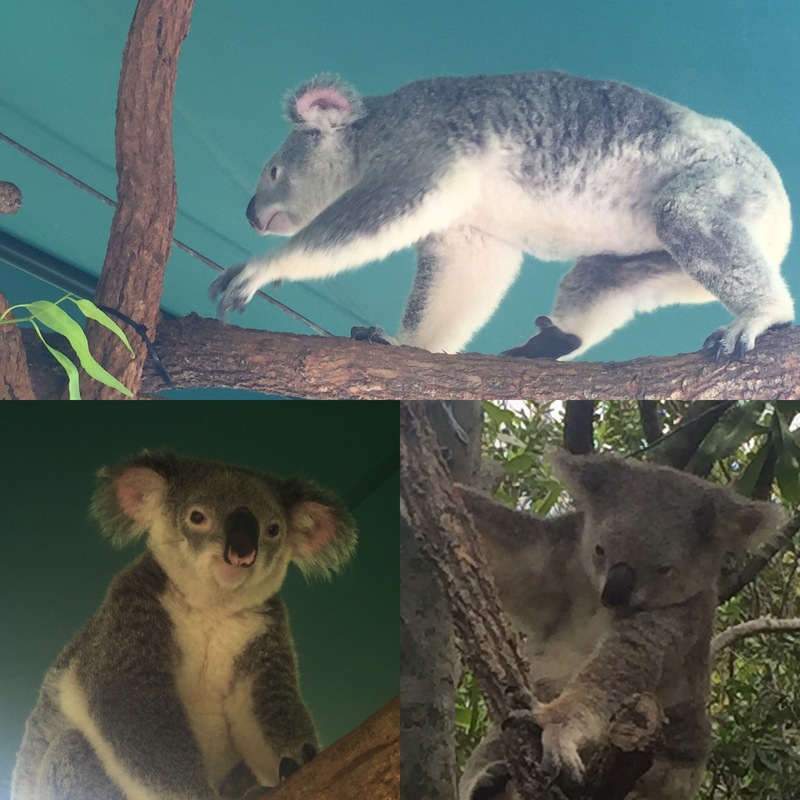 We weren’t able to hold a koala as the ‘experience’ was sold out but we did go to the koala walk and got to stroke one. They’re really fluffy and have the cutest little faces – even though I’ve seen them loads now I still love it every time because they’re so cute! Probably our favourite of all the shows was with the tigers. 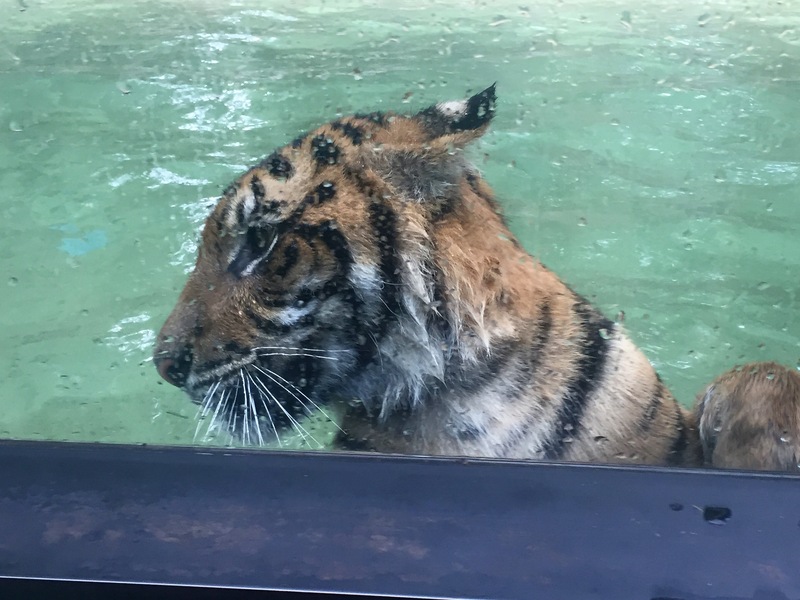 We had watched the BBC documentary series on this zoo breeding the tigers and the cubs going to live in one of the keepers houses so we couldn’t wait to see the tigers close up. 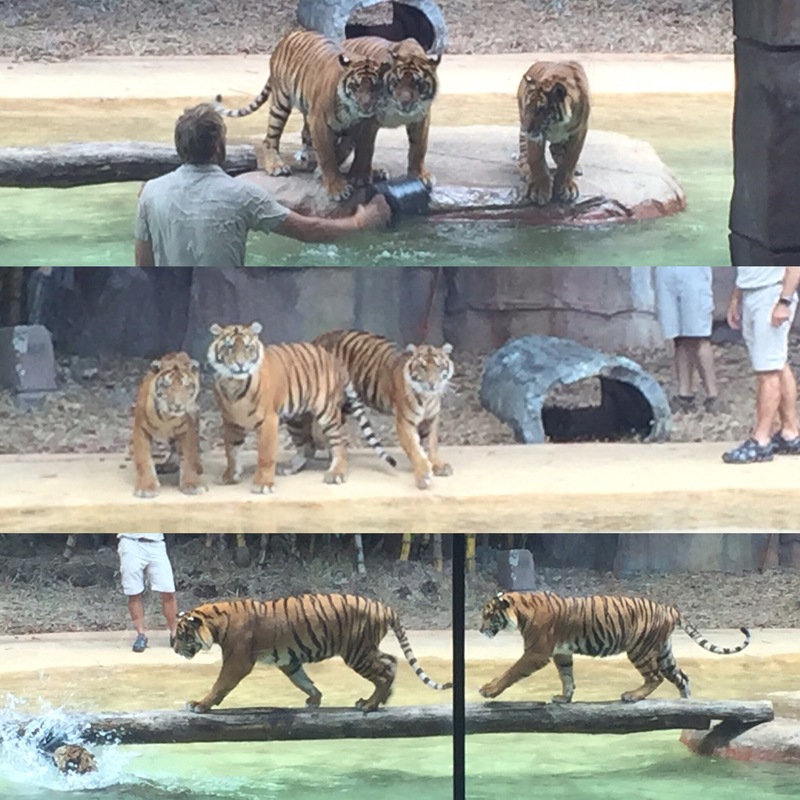 They were different tigers to the ones on the programme and there were three cubs who were all playing with the keepers. 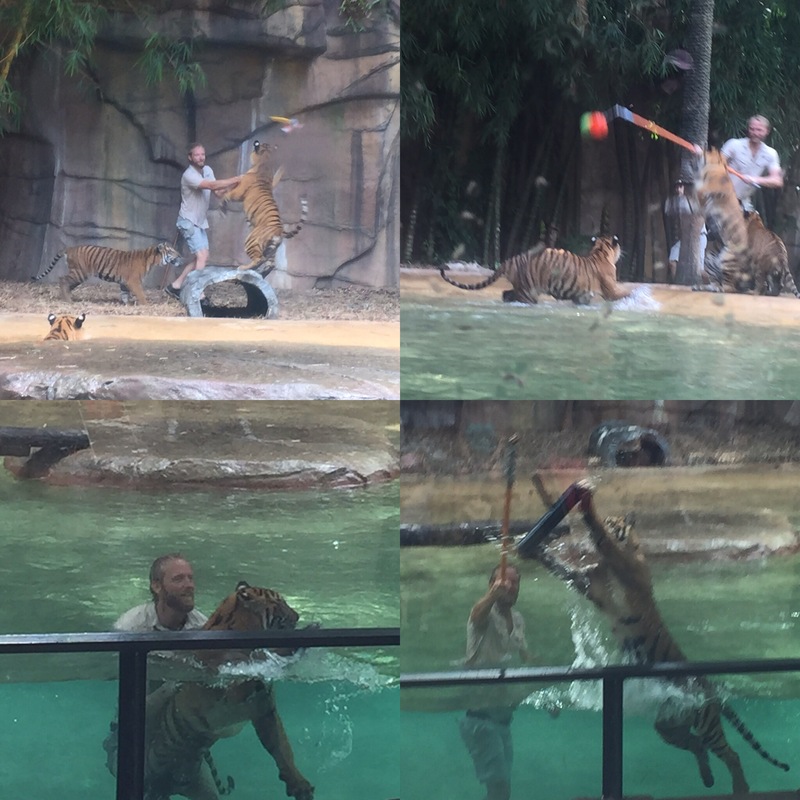 The shows was a big play time for the tigers with lots of toys and the keepers tried to get them swimming in the water. 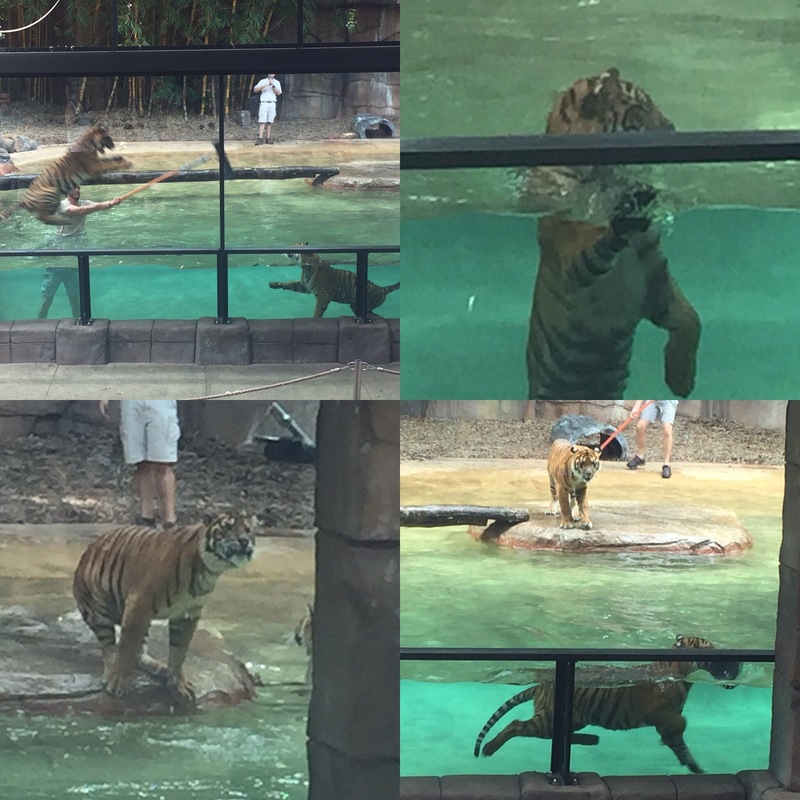 It was amazing to see them running around and swimming in the water, I could have watched them all day. 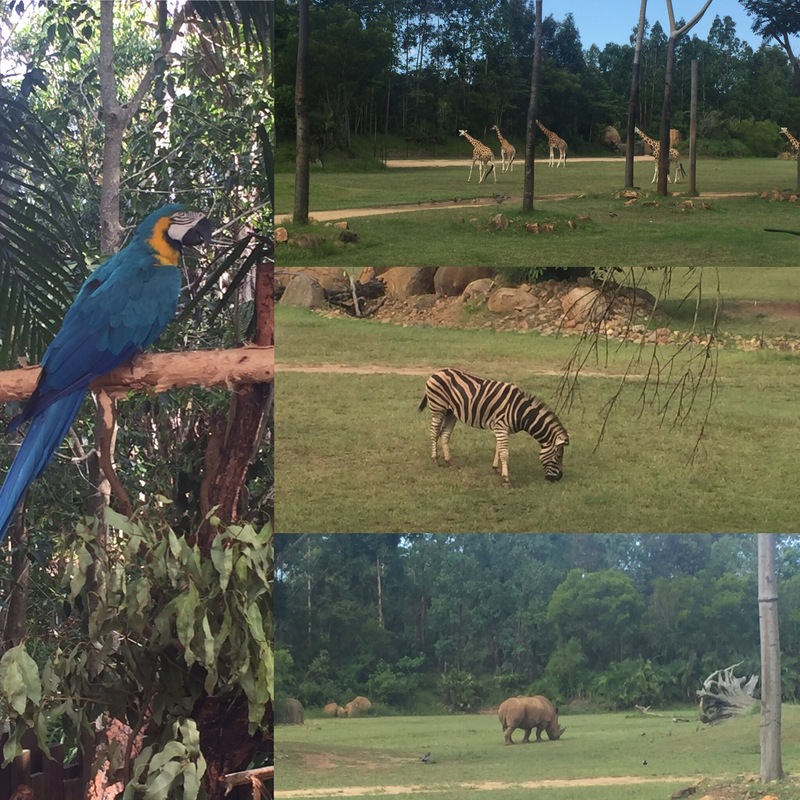 We managed to see all the animals in the zoo in the time we had. The place is massive with a huge ‘savannah’ area at the top where there are giraffes, zebras and rhino all in together like it would be in Africa (minus the animals that would try and kill them of course). 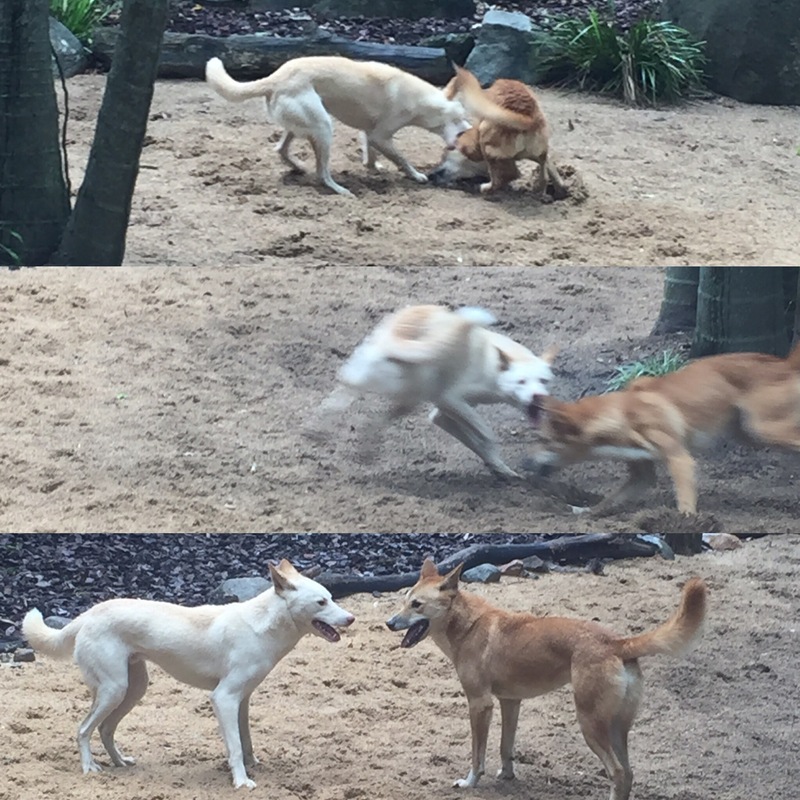 It was such a good day at the zoo and we’re so glad we went! 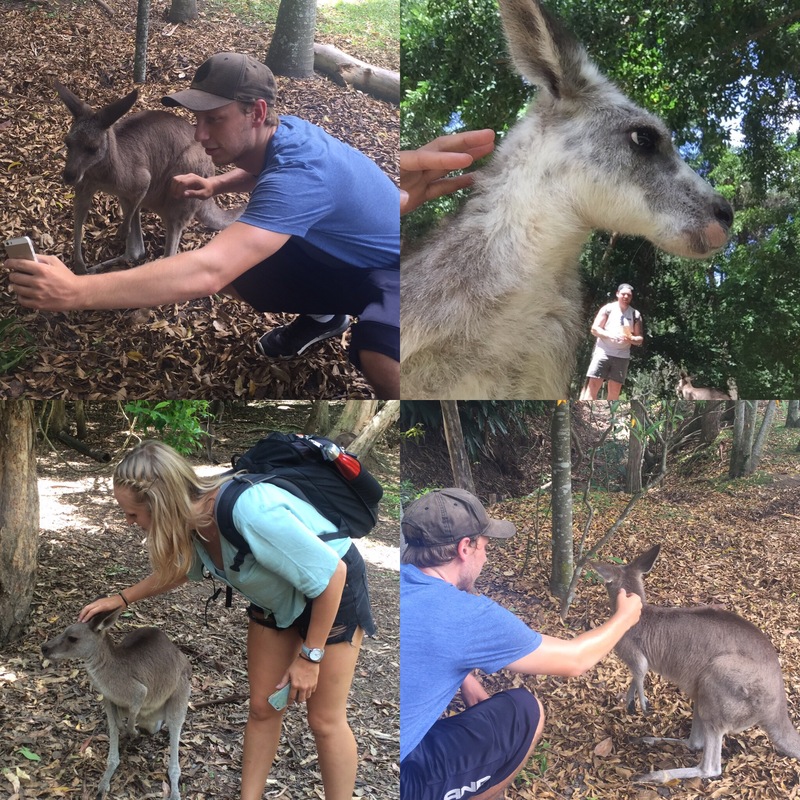 When the zoo was near to closing we got the bus to Noosa were we would be spending the next week for our Fraser Island trip.